They were kids when they first walked into our local high schools. They walk out now as adults. What makes a close-knit community? It's all about sharing a common experience. As the students of the Class of 2018 receive their diplomas, turn their tassels to the left and toss their caps into the air, they join an unbroken chain of Forest Grove, Cornelius, Hillsboro, North Plains, Banks and Gaston residents before them who sat in those same classrooms, ate lunch in those same cafeterias, walked down those same halls and got those same certificates. 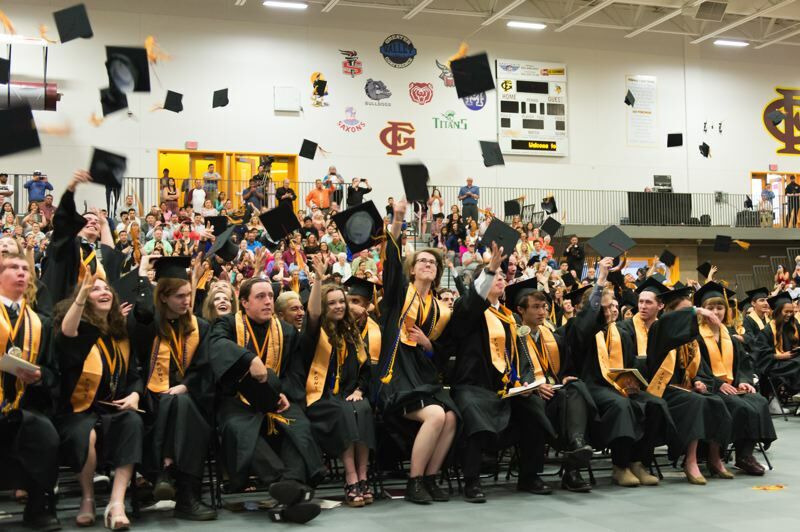 Check out the News-Times' photo galleries from commencement ceremonies this month for Forest Grove High School, Banks High School and Gaston High School. Not everyone who lives here is from here, of course. Some of us come from nearby — Beaverton, Sherwood, McMinnville, Scappoose, Oregon City. Some of us come from further away — Idaho, California, Texas, Michigan, Ohio. Some of us crossed a border, or voyaged across an ocean. But everyone who lives here — lifelong residents who can prove it by their diplomas and transplants who have adopted this community as their own — can appreciate the special occasion of graduation season. Many of the high-schoolers — no, not high-schoolers, not anymore — who are walking across a stage this month will head off to college or vocational school. Some of them might stay close to home, attending a four-year school like Pacific University, Linfield College or Portland State University, or a two-year school like Portland Community College. Others will head off to Corvallis or Eugene or Monmouth, or north to Seattle or Ellensburg or Pullman in Washington, or to schools far beyond. Some will make their adult lives here in western Washington County. Some will become transplants themselves, who can't say "I went to Sam Houston" but will nonetheless be Houstonians — or wherever they end up. Either way, it all starts here for them. Graduation is more than just a stuffy annual routine. We're welcoming our next cadre of adults into the wider world. The Class of 2018 is joining the Classes of 2017, 2016, 2006, 1986 and 1946 in that realm. As always, this occasion is a good time for us to think about the world that we have made for our newest high school graduates. Many of these 2018 alumni walked out of classes just a few months ago to protest gun violence in schools — a scourge that was nearly unthinkable before the Columbine High School massacre in 1999, just about a year before most of them were born, and which has since become horrifyingly routine. Some of them walked out of classes a couple of years ago to protest the hanging of a banner at Forest Grove High that made reference to the construction of a border wall with Mexico. They come of age to vote at a time of extreme political polarization. They come of age to join the military, as some of them are doing, at a time of fragile detente — peace teetering on the brink of war — with Iran and North Korea, even as the longest war in our history wears on in Afghanistan. They come of age to work and begin careers at a time of sweeping economic changes, with globalization and automation transforming the job market. They come of age to make their own decisions about their bodies at a time of shifting societal views on issues like genetic manipulation and therapy, marijuana use, and trans and non-binary gender identities. And, not least among the challenges they will confront as adults, a scientific consensus has emerged over the course of their lifetimes that the Earth's climate is rapidly warming, that humans are largely responsible for driving those changes, and the ultimate outcome of that trend is not yet fully understood. These are the new graduates we raised here in this community. Our teachers, coaches, pastors, troop leaders and school counselors helped to educate, guide and mold them in their formative years. They learned to read from our libraries. They learned to drive on our streets. And their parents and guardians had the greatest influence on them of all, certainly imparting lessons from their own teenage years — their experiences in the Class of 1979, the Class of 1987, the Class of 1995 — and raising them to contribute to our society. Congratulate them. Celebrate them. Hope we didn't screw things up too badly for them. And accept them as they take their place alongside us as adults.